The Earthly Recordings of Sun Rais a docu-discography of the music of Herman Poole Blount (arrived on the planet May 22, 1914; left the planet May 30, 1993). Sonny Blount is much better known by the name he adopted in 1952: LeSony'r Ra, or Sun Ra. Sunny cut his first sides in 1946 with blues shouter Wynonie Harris. Around 1951, he formed his Space Trio; after several experimental ensembles of different sizes, he built his Arkestra in 1955. From 1954 until shortly before he left the planet, he produced over 120 LPs that got some kind of official issue, and over 20 45-rpm singles, not to mention many hundreds of rehearsal and concert tapes. The Arkestra continues to perform today, under the leadership of Marshall Allen. All of Sunny and the Arkestra's recorded music, released or unreleased, is documented to the fullest extent possible in The Earthlies. Concerts that are not known to have been recorded are also mentioned when we know of them. 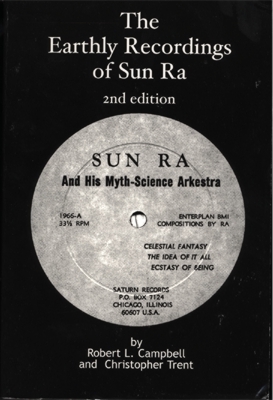 The first edition of The Earthly Recordings of Sun Ra, published in 1994 by Cadence Jazz Books, was a 247-page paperback book listing around 520 sessions. It included an album index, an index of musicians, an index of tune titles with composers, and a film/video index. 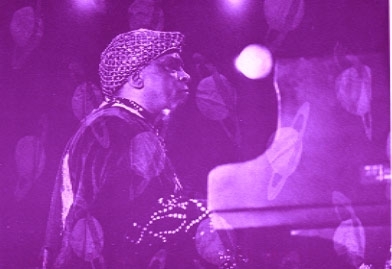 With the help of British Sun Ra expert Chris Trent, I have completed an expanded and updated second edition of The Earthly Recordings of Sun Ra. The second edition was published on May 31, 2000. It now runs to 847 pages and 789 sessions. There are many more concert listings; there is also new historical research, derived from the Red Saunders Research Foundation, on Sun Ra's work as an arranger for Red Saunders and other bandleaders in Chicago. To the indexes of the first edition, we have added a special index of all known Saturn serial numbers (as an aid to collectors who have to deal with hybrid pressings, unusually titled LPs, or LPs in blank sleeves). To help readers sort out issued material from unissued tapes, we also now indicate the sessions that appeared on issued recordings in bold print in both the musician and the title indexes. The Earthly Records of Sun Ra, second edition, carries a list price of $80. However, you can obtain it for $60 plus $12 for shipping from Cadence Jazz Books, Cadence Building, Redwood NY 13679-9612 USA, cjb@cadencebuilding.com. The phone number for Cadence Jazz Books is (315) 287-2852; fax number is (315) 287-2860. Although a hard-copy third edition is several years in the future, Chris Trent and I will continue to update our listings with new or corrected information about Sunny's recordings and concert tours. If you have information about recordings not mentioned in the second edition ofThe Earthly Recordings, my email address is campber at clemson.edu. Return to Robert Campbell's Home Page.